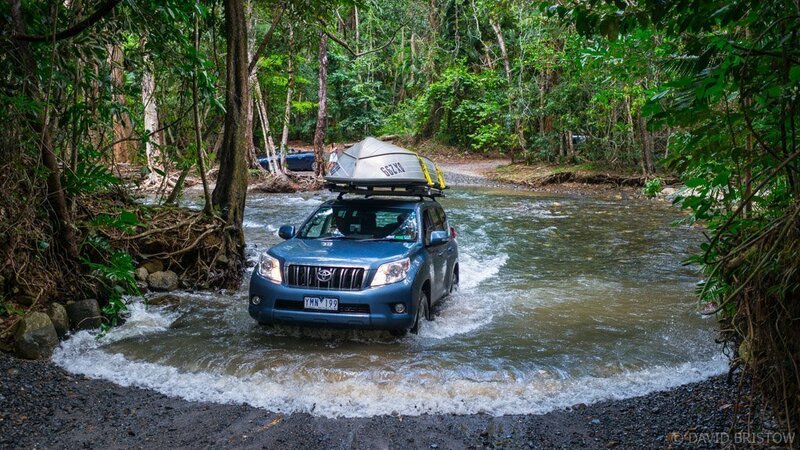 If you can do it outside, you can do it in the tropics and this list of top outdoor adventures from Cairns to the Tablelands and Daintree National Park is oh-so-budget-friendly, guaranteed to fill your days and mothball your wallet. All your need is a lazy couple of weeks, a set of wheels and some outdoor adventure toys. Snorkel with jungle perch: stare up at the rainforest as you float in clear, chilly pools and snorkel with the jungle fish that tickle your toes. Take an easy walk and BYO a picnic to Crystal Cascades, a short drive from the Cairns CBD. 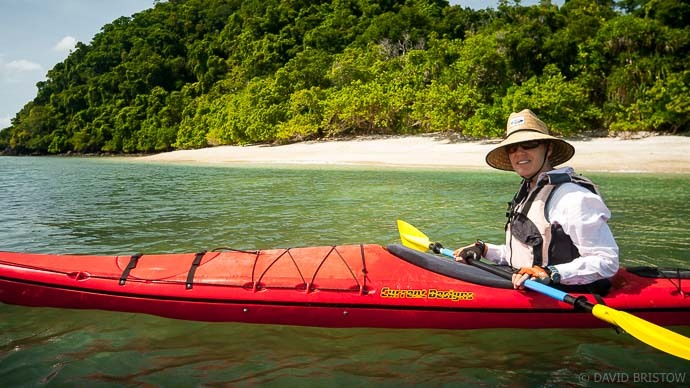 Kayak to Snapper Island: On a calm day, see-through seas surround this coral-fringed national park island where you can step off white sand beaches to join an endless procession of fish and turtles, gliding over staghorn and plate coral and giant purple brains peppered with vibrant clams. Push off from Wonga Beach (90km north of Cairns) and allow 1.5-2 hours to reach the island. 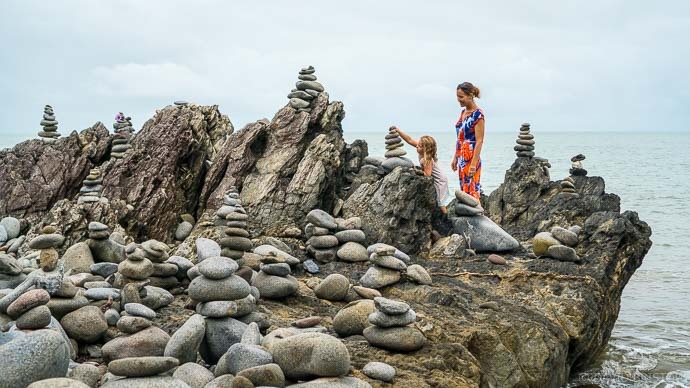 Balance your rocks: add your cairn to the outdoors installation taking shape on the edge of the Coral Sea on one of Australia’s most scenic drives – the Captain Cook Highway from Palm Cove to Port Douglas. Go body boarding at Ellis Beach: easily the prettiest, palm-fringed beach in the region. 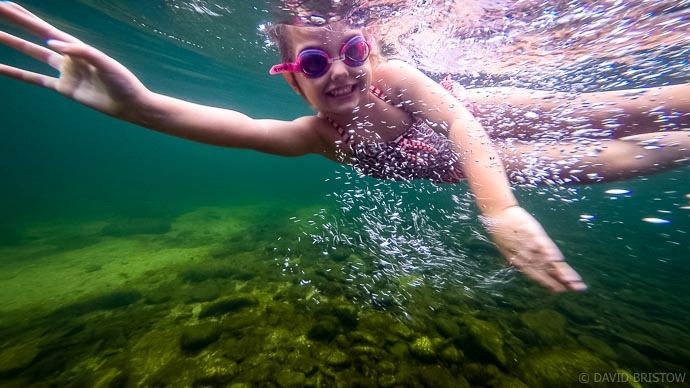 Chill your bones at Babinda Boulders: Ulysses butterflies flutter above these clear, deep, rainforested pools and the best free camp in the north is just a short walk away, perfect for sunrise wake-up swims. Mountain bike the Goldfield Trail: Nestled against the rainforested slopes of the Bellenden Ker Range, the Goldfield Trail winds for 19km through Wooroonooran National Park. From Goldsborough Valley you can bike as far as the causeway over the Mulgrave River, then continue on foot to Babinda Boulders and back. Climb through the canopy to Barron Falls: For vertigo-inducing views, follow the Budaadji Canopy Walk to see Barron Falls plunge 265 metres off the Kuranda Range. Join a Bat Chat: Distinguished by the pale fur that rings their eyes like a pair of spectacles, the beautiful spectacled flying foxes that roost in large numbers in Cairns are the focus of Bat Chats – free information sessions that set out from the City Library on Abbott Street. Peer into a pitcher plant: get up close and personal with pitcher plants, vibrant tropical orchids and lots and lots of fluttering butterflies released into the Conservatory in the Cairns Botanic Gardens. Chill with music on the ‘nard: spread a blanket by the lagoon on the Cairns Esplanade and groove to free afternoon music sessions, every Saturday and Sunday from 2-5pm. 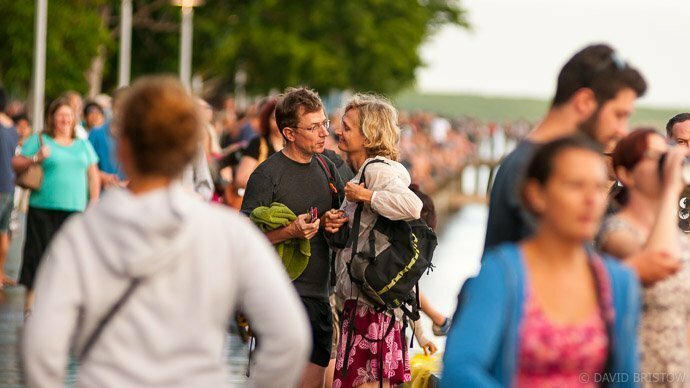 Get fit for free: join travellers and locals on the Cairns Esplanade for pilates, Sahaja yoga mediation, boxfit, beach volleyball, bouldering, zumba, aqua aerobics and more (head to cairns.qld.gov.au for daily session times). Get tanked: There’s an ever-changing program of exhibitions, festivals, art shows and music gigs to enjoy at Tanks Art Centre, many with free entry. Find it in the Cairns Botanic Gardens. 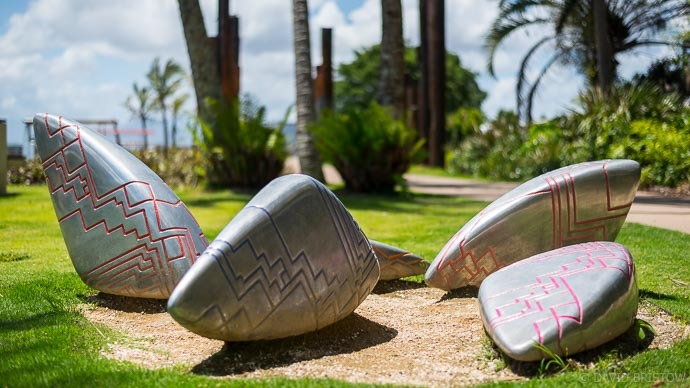 Get arty: changing exhibitions, free entry and lots of interesting art classes gets the Cairns Art Gallery onto this list. Taste-test exotic tropical fruits: snack on free samples at Rustys Markets in the Cairns CBD (open Friday to Sunday) and snare the biggest bargains as the market closes at 3pm Sunday. Get wet at Muddys: burn off energy at this free water and play park on the Cairns Esplanade with a café and free gas barbecues on site, and a skate bowl and rock bouldering park close by. Tap into free Wi-Fi: Log-on anywhere in the Cairns CBD or at any of the city’s libraries. Catch a free festival: join in the fun of Cairns Festival (August), Cooktown Discovery Festival (June long weekend), Reef Feast Palm Cove (October), Chinese New Year in Cairns (February) and more. Swim in a volcanic crater: head to Lake Eacham to swim with saw-shelled turtles in a translucent, 70 metre-deep crater lake, girthed by rainforest and perfect for standup paddleboarding. 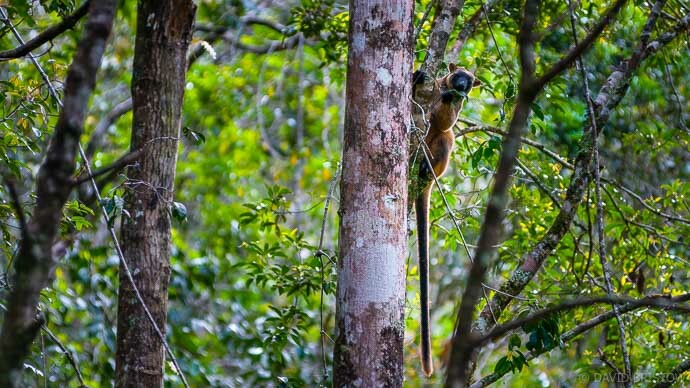 Encounter a rare tree-kangaroo: resembling a cross between a bear and a kangaroo, Lumholtz’s tree-kangaroos inhabit the canopy in Mount Hypipamee National Park. While you are there, check out the dramatic, water-filled volcanic explosion crater with sheer granite walls that plunge 140m. Get twitching at Hasties Swamp: Known to Indigenous Yidinji people as Nyleta (where the waters meet) and renowned for its incredible diversity, Hasties Swamp is home grey teals, pink-eared ducks, egrets, ibis and magpie geese that congregate in numbers of up to 1500. Stake out the two-storey hide, signposted 4km south of Atherton on the road to Herberton. See Australia’s widest waterfall: Big Millstream rates as our widest, single-drop waterfall and you can free camp nearby at Archer Creek Rest Area. 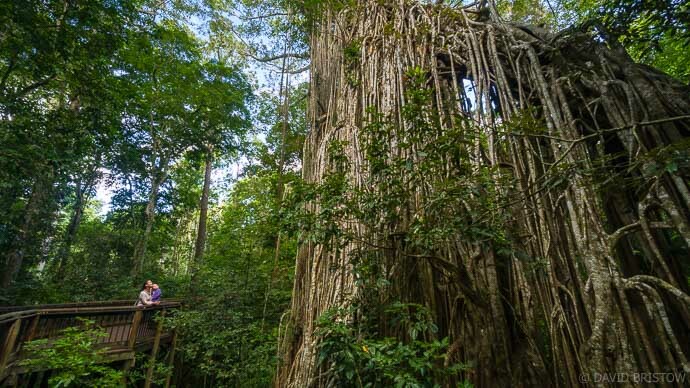 Hug a (500-year-old) fig tree: as tall as a 12-storey building with a girth of 43 metres, you can’t miss the Cathedral Fig Tree in World Heritage-listed Danbulla National Park, west of Cairns. Encounter freshwater eels (& turtles): head for the big, cool pool beneath the Atherton Tableland’s uber scenic Millaa Millaa Falls. Taste-test biodynamic dairy goodness: try davidsons’ plum, mango or bush honey yoghurts, and a range of cheeses – marinated feta, ricotta and cheddar – at Mungalli Creek Dairy in Millaa Millaa. There are free tastings from 10am-4pm daily. Cycle the beach: pedal Port Douglas’ premier stretch of sand – the famously firm Four Mile Beach. 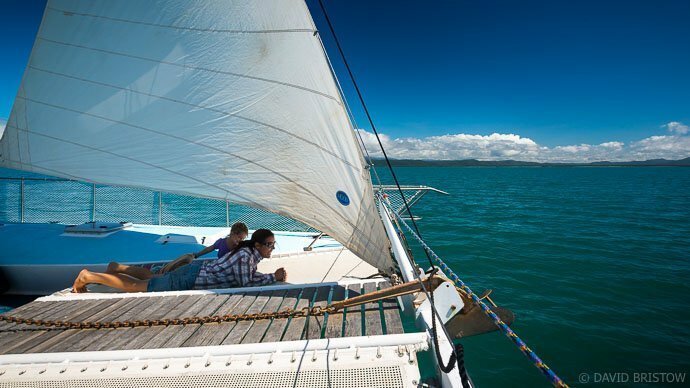 Go sailing: Port Douglas Yacht Club hosts super-friendly, free social sails every Wednesday afternoon called ‘WAGS’ (we all go sailing). Register at the clubhouse on Dickson Inlet from 4pm (18 years plus, visit portdouglasyachtclub.com.au. 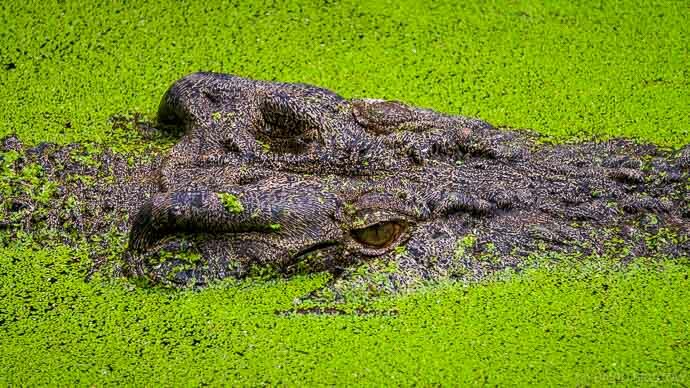 Encounter Daintree River crocs: These superior, prehistoric hunters dominate the food chain, hauling out on the banks of the Daintree River at low tide. Spot them anywhere from the ferry crossing to Daintree Village. 4WD the most controversial track in the north: Bulldozed through pristine rainforest back in 1984, the Bloomfield Track’s 33km-long stretch of gravel and concrete leads adventurers across Emmagen Creek, 5km north of Cape Tribulation, to deserted, coconut palm-fringed beaches and secluded rainforested swimming holes. Go butterfly spotting: iridescent blue Ulysses butterflies accompany walkers on the easy trail that crosses Cape Tribulation to Myall Beach, a magical sunrise viewing spot. Wear something blue to attract the attention of these butterflies, found only in coastal north Queensland. Beach comb Thornton Beach: trek south to the croccy mouth of Cooper Creek for grand views of the often-clouded summit of Thornton Peak (1375m), reputedly one of the wettest spots in Australia and home to the Thornton Peak melomys and rare Bennetts tree-kangaroos.